MULI-PURPOSE KIDS WATCH FOR DAILY USE - 13 digits LED display for time, week and date.Daily alarm,chime hourly;12/24H format selectable,auto calendar;1/100 seconds chronograph;Count down;EL backlight. 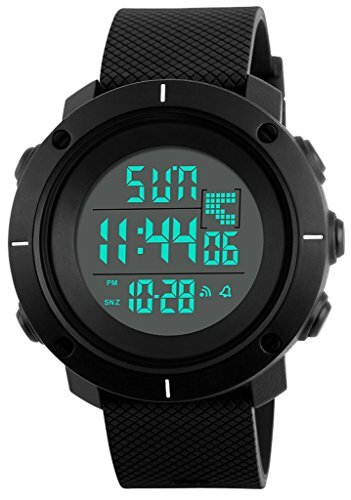 DIGITAL WATCHES FOR DIFFERENT AGES - It is also fitting to boys and girls who like big face watch. This simple and classical design watch will go great with any outfit and any occasion. WATERPROOF KIDS WATCH - 164FT/50M Water resistant,no problem for cleaning,shower,swimming and divings at the beach. KIND NOTE - Please DO NOT press any buttons in the water or wear this watch for long-time underwater activities.